Romancing SaGa was released in 1992 from Square on the SNES. I actually managed to kill the first boss in Albert’s scenario, so I thought I’d put up some screenshots to give my readers a feel for how the game looks and the issues I’m having. 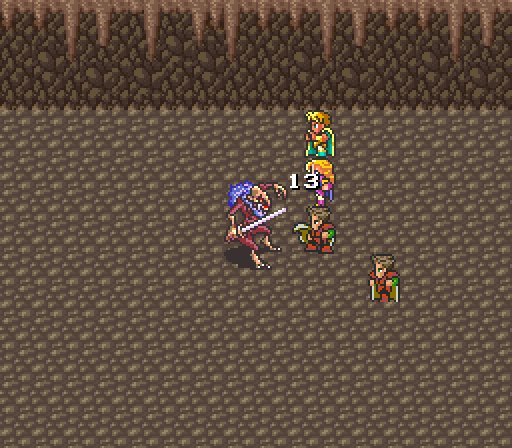 From top to bottom, this is Albert, his sister, and two guards fighting an enemy in the caves. The 13 damage is from the enemy using a knife. Albert wakes up in bed, and is asked to take care of some monsters in the cave to the east. I picked a right handed Magic Knight (father and mother) for my Albert, and he had 40 HP. He started with a sword, a knife, and 4 castings of a Light spell. His sister, Diana, had a sword and about 70 HP, and the two guards with him had HP in the 40’s. One had a knife, and the other had a knife and a bow. Basically, one more turn and I would've died fighting the first boss. Outside, it was pretty easy to get down to the cave without any major fights, but inside the cave you’re highly unlikely to get to the boss without at least four fights. One of the monsters mixed in the random groups included a fat pale troll that seemed to be almost impossible to kill. Fleeing battle isn’t too bad, but I couldn’t find any way other than Albert’s medicine to heal. If you didn’t know the right path through the cave, you could probably get into an unwinnable situation. 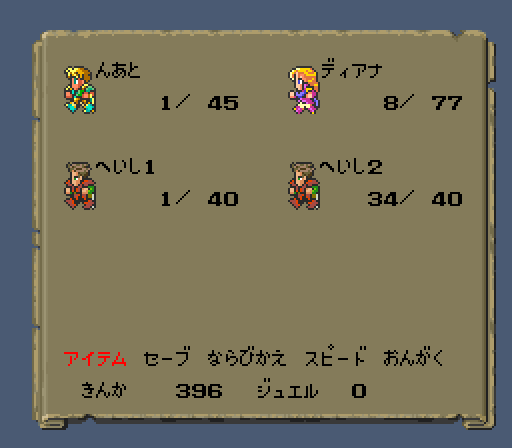 The boss of the cave did about 50 HP damage with his fire magic, and Albert only had 45 HP when I got to the boss. Everyone with 1 HP in the screenshot above died during the boss fight. 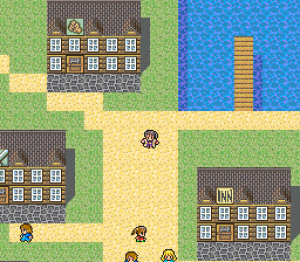 While the sprites are very square and the tiling is obvious on the path, the game is pretty in motion and the towns feel alive with the number of NPCs. Unfortunately, getting through the dinosaurs to advance the plot is almost entirely up to luck. Basically, you can only pass dinosaurs quickly on the left or right, or slowly if you are behind them. Passing from the front, or taking too long while beside one will get you into a fight. You need to head through a U shaped passage while dodging about twenty or so dinosaurs to get to where the egg is hidden. With our turn order scrambled by an ambush, one character prepares to cast a spell while Gray and his companion work their way to the front lines. Of course, making Albert a mage type of character isn’t a great idea. And dodging enemies gets easier with time. What’s the game like, ignoring those issues? The music is gorgeous and the graphics have a lot of nice details. For example, when Albert’s fleeing his castle while it is under attack, his running animation is much faster than normal. 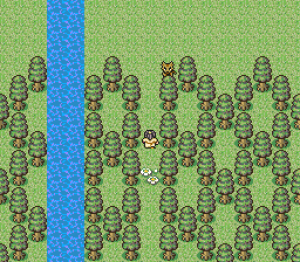 People have fighting / casting sprites in battle, and while they’re not super detailed, you can tell the difference between Gray’s mage and Diana. Ironically enough, the idea of creating your own hero and visible monsters would’ve been seen as a great game in 1992. However, I doubt that people would’ve gotten past the flaws in Romancing SaGa if it had been released in the US. 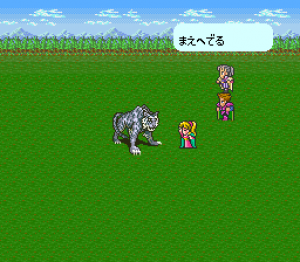 Near a tree, you can see one of the visible enemies in Romancing Saga. Anyway, have there been any successful attempts to get Romancing SaGa 1 and 2 translated? I recall that a couple years ago no one had finished the projects, so I was curious. Of course, I think 1 was translated and redone on the PS2 as Minstral’s Song (I think that’s the title), but 2 so far is untranslated. 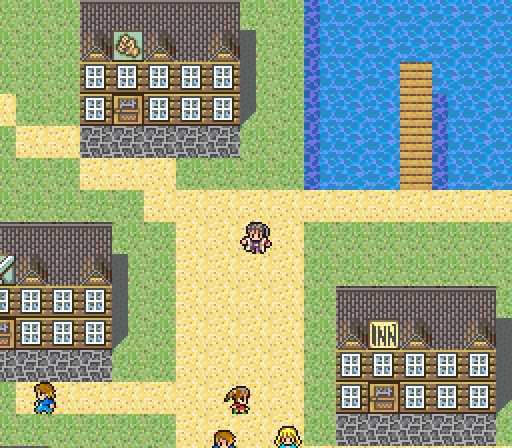 those battle sprites are very ffv-esque! Thank you for the nice comments, Allahweh. From what I heard, Gideon Zhi is working on Romancing Saga 2. The games have some ridiculous coding, so it’s not exactly easy to translate the games. 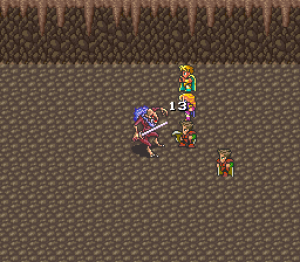 For example, I do know that Romancing Saga is invisibly tracking a sort of Event Rank in the SNES version. From a Japanese fansite, it sounds like you get events automatically happening and locking off certain things at very late dates in the game (so, you’d need to play through a couple of characters for it to be any problem.) 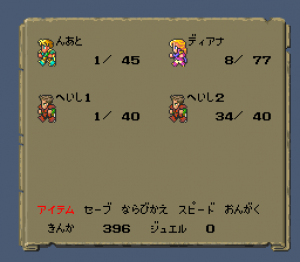 In the PS2 remake, Event Rank issues happens a lot more quickly, which basically forces you to avoid almost all battles in comparison to the grinding in the SNES version. Romancing Saga 2, from what I heard, is much more complex, more attractive, but can basically make your game unwinnable if you don’t have certain skills or if you accidently trigger the next generation. I wonder if the Android “Final Fantasy Legends” isn’t the Wonderswan remakes of the Gameboy games. They’re a lot simpler to update compared to the SNES versions. It feels like there may be as many sprites in Romancing Saga. The town graphics feel a little more “bland” to me. 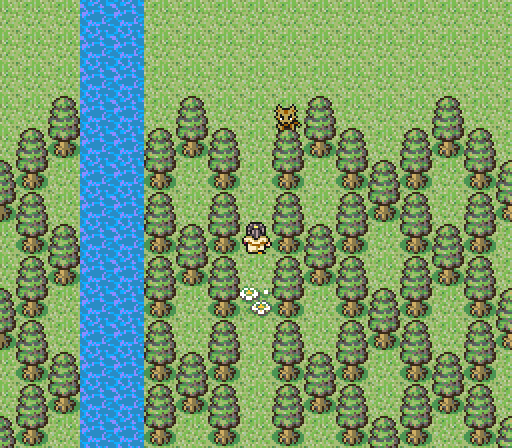 I haven’t seen the glitzy overlaid treetop layers in FFV, for example, or major Mode 7 usage. However, there’s tons of characters, with little details to try to make them feel different, with a range of animations.